It has been just over two centuries since the signing of the landmark Treaty of Utrecht was signed, thus bringing to an end to the fratricidal War of the Spanish Succession. The upshot was that a member of France’s Bourbon family, in the person of Philip V, occupied the throne and brought an end to the Habsburg line in Spain. The so-called Peace of Utrecht came about in March and April of 1713 following a series of treaties that were reached between several European states, including the Dutch Republic, France, Great Britain, Portugal, Savoy, and Spain. The agreements brought an end to French ambitions of conquest on the European sub-continent, while they also established a European system based on the balance of power. The grandson of French King Louis XIV was Philip, Duke of Anjou, who became King Philip V of Spain and thus confirmed the succession stipulated by Spanish King Charles II before his death in 1700. Known as “the Bewitched,” Charles II had been considered an unsuitable ruler and died childless. Spain’s possessions in Europe were carved up by the Utrecht agreements. Savoy was apportioned parts of the Duchy of Milan as well as the entirety of Sicily. Holy Roman Emperor and Archduke of Austria Charles VI, a Habsburg, was given the Spanish Netherlands, the Kingdom of Naples, Sardinia, and the rest of the Duchy of Milan. In addition, Spain lost strategic Gibraltar and the island of Minorca to Great Britain, while also conceding a slave-trading monopoly to the British. Spain managed, however, to maintain its claim to the “case of the Catalans,” while Barcelona – the capital of Catalonia - remained besieged. The supporters of the Archduke Charles, who had claimed the Spanish throne as Charles III, were forced to leave Spain when they refused to accept the authority of the new Bourbon king. When Barcelona fell to the Bourbon forces on September 11, 1714, supporters of the Archduke fled. They sought refuge in Naples, Flanders, Sardinia and Sicily. However, their flight was to continue. King Philip V, the new Bourbon king of Spain, recaptured both Naples and Sicily, forcing Catalan refugees to flee again, this time to Vienna. Many were reduced to mendicancy, despite their titles and former wealth and station, and wandered the streets of the Austrian capital seeking refuge. The Habsburgs decided to relocate them so that their presence would no longer be inopportune to the Viennese. In 1735, a site was chosen for them in swampy lands of the fractious Balkan Peninsula, where the Austrians held the line against the powerful Ottoman Empire. 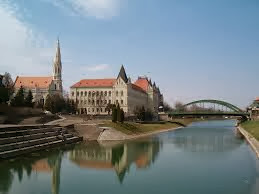 The area now occupied by the Serbian town known as Zrenjanin had been recently conquered by the Austrians. Putting the Catalans there served the Empire’s purposes. Financed by the Holy Roman Empire, a thousand industrious Catalans colonized their new home in the Balkans. There they founded New Barcelona, planting mulberry trees with the intention of starting a silk industry. Silk had long been produced in Spain and Catalan traders had plenty of experience marketing their silks and other textiles throughout the Mediterranean Basin. The Austrians were glad to see the Spaniards leave Vienna, having put them in harm’s way on the frontier where the Ottomans plotted revenge. Clashes between the Habsburgs and the Ottoman Empire resumed, and the area occupied by the Catalans suffered numerous attacks by the Turks. Various plagues also killed hundreds of the Catalans. Only three years after its founding, New Barcelona was abandoned by the Catalans, who fled to Budapest and Vienna. In 1808, a fire raged throughout what was left of the city founded by the Spanish refugees. All traces of their presence were destroyed. In Zrenjanin today, only the presence of mulberry trees recalls the Spanish pioneers in the Balkans who came to naught.